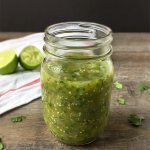 This Roasted Tomatillo Salsa recipe is made with tomatillos, onion, cilantro, jalapeño and lime. It makes a fresh and healthy dip for your favorite tortilla chips! Up until this year, I had never purchased tomatillos before. The tomatillo salsas that I’d eaten were not my fave, and so I basically thought I just didn’t like them. Then,I made my Green Sauce, and that totally threw that idea out the window. Man, that sauce is good! If you haven’t made that one, get on it! So, my next obvious plan was to try making a green Mexican salsa. This time though, I roasted the tomatillos in the oven for a short amount of time. It’s super easy to do, and adds another depth of flavor. You want to look for tomatillos that have fresh looking husks snugly attached and are dry and firm. I like to carefully peel back the husk slightly to take a peek and make sure that they are bright green and unblemished. Place an oven rack 4 to 6 inches below the broiler, then preheat broiler. Or, preheat oven to 500°F. Let broil until they begin to turn brown in spots and their skins begin to burst, about 7-8 minutes. Remove from the oven and let cool. Once cooled, peel off the skins. Place all of the ingredients into a food processor and pulse into a coarse puree. 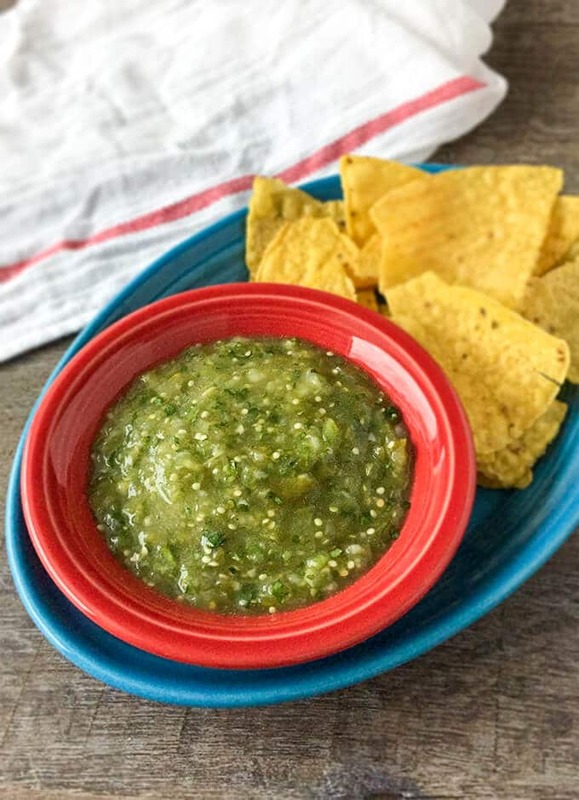 This Roasted Tomatillo Salsa can firm up a bit once refrigerated, so you may want to let it sit out for a few minutes before serving it with your favorite tortilla chips. By the way, if you want some of the tastiest and healthiest chips, the Jackson’s Honest brand sells the best I’ve come across. Whole Foods has them, but I’m not sure who else does at this point. Not sponsored, I just love their chips and like to promote products that I personally use and love. 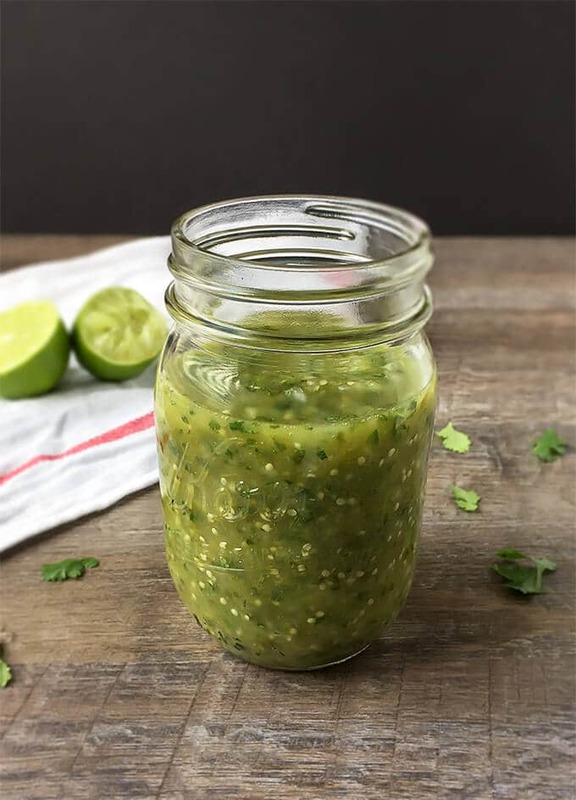 This Roasted Tomatillo Salsa is made with roasted tomatillos, onion, cilantro, jalapeño and lime. It makes a fresh and healthy dip for your favorite tortilla chips! Adjust oven rack to 4 to 6 inches below broiler, then preheat broiler. 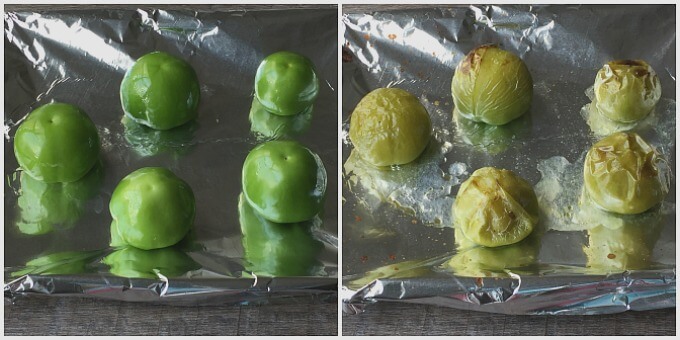 Cover a rimmed baking sheet with foil and place the tomatillos on it. Place on the rack below broiler and let broil until they begin to turn brown in spots and their skins begin to burst, about 7-8 minutes. Remove from the oven and let cool. 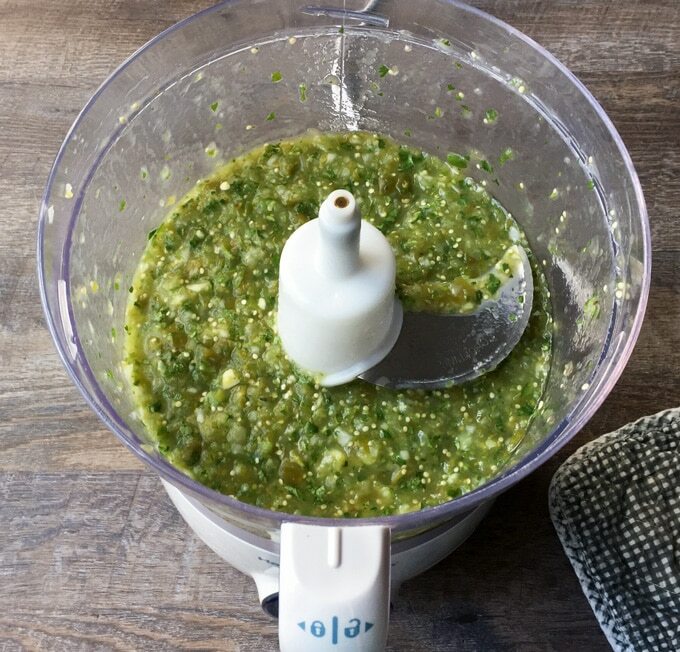 When the tomatillos have cooled, place them into the bowl of a food processor or a blender along with the rest of the ingredients and blend to a coarse puree. Let stand at least 30 minutes before serving to allow the flavors to marry or place into an air-tight container and refrigerate for 3-5 days. Check seasoning before serving and adjust if necessary. If refrigerating, let come back to room temp. before serving.